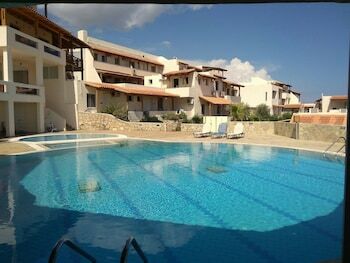 Located in Ierapetra, Creta Suites is within a 10-minute drive of Koutsounari Long Beach and Agia Fotia Beach. Featured amenities include dry cleaning/laundry services, luggage storage, and laundry facilities. A roundtrip airport shuttle is provided for a surcharge (available 24 hours), and free self parking is available onsite. Located in Hersonissos, Nana Angela Apartments is by the sea, within a 10-minute drive of Ekklisia Agios Konstantinos and Convention Centre Creta Maris. The front desk is staffed during limited hours. When you stay at this villa in Apokoronas, you'll be within a 5-minute drive of Historical - Folklore Museum of Gavalochori. Free self parking is available onsite.